Sargent Crabapple is a deciduous shrub that belongs to the family of rosaceae. Native to Japan, this tree grows up to 6-8 feet and spreads 9-15 feet. The tree does well in loamy, medium moisture well-drained acidic soils. But basically it adapts to a wide range of soils especially the clay soil. Grown in full sun this plant’s pruning is done in May to early June. This period is normally after flowering but before flower buds is formed for the following year. 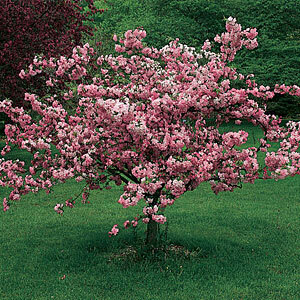 When grown as a shrub, Sargent Crabapple grows to 6-8 tall and spreads to 15 wide. Most people would love to grow it as a dwarf tree, but it can be grown for all purposes. The leaves are dark green and smooth. They vary in shape whether with or without three lobes. They later turn yellow and fall. Abundant bloom occurs only in alternate years. It occurs in April where pink pale buds are seen. They later open to white flowers which are followed by small red crabapples that mature and fall. The fruits of this tree are pea sized and have a sweet flavor like rose hips but they are not used for cooking. Birds, butterflies and hummingbirds get attracted by these fruits and they use them as food. Its dense foliage provides shelter for these birds. This tree looks good when planted in groups near fences, borders or hedge. It is resistance to air pollution and this explains why it is planted along the fence. For a smaller garden, they are not very effective because of their alternative year bloom. Sargent crabapple is disease resistance so has very low maintenance. Though it has a minor susceptibility to leaf spot, apple scab and fire blight, they don’t affect it much. Insect pest that attack it are tent caterpillars, aphids, Japanese beetles and borers, but also they don’t bother the tree much.